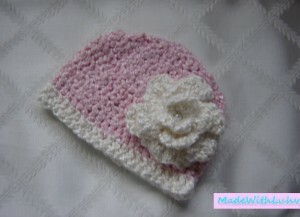 This beautiful handmade baby girl hat size 3 - 6 months hat feels so soft and comfy. It is crocheted using Bernat Bamboo "Linen" yarn which feels like silk and has a natural sheen. Your baby girl will look like a princess in this crocheted beanie hat. It is a perfect photo prop. It has a big fluffy white flower with a centered pearl. The baby girl hat may be hand-washed, shaped & lay flat to dry. I love working with Bamboo Blend Yarn. It is so soft and silky and helps me create luxurious, quality items. Bamboo is a naturally eco friendly fiber that requires no pesticides or fertilizers to grow and is extremely replenishable. Bamboo yarn is made by processing the stalk and combing the fiber strands. It has a cool and silky soft touch and is perfect for knitting or crocheting. It is itch free, naturally hypo allergenic and anti bacterial and is three times more breathable than cotton. We found the best price for Bernat Bamboo Yarn at JoAnn's -- they even beat Walmart, Michaels & other Craft sites and stores.